Here you will find an absolutely exquisite time on your vacation while enjoying condo rental here in Lake Havasu. We offer condo rentals and sales to tailor to those who want a once in while vacation here or for those who can't get enough of the fun and the sun. Our goal here is to make your vacation in lake havasu one that you will never forget. Whether you take advantage of one of our condo rentals or are prime condo sales opportunities, we will find the perfect match for you. Here you will find the beautiful and most enjoyable year round playground in the Sunny South West Desert. Offering countless activities, delicious fine dining, and the perfect environment for either that family vacation, or romantic getaway, or even a unique idea for a business trip. 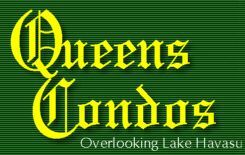 Queens Condos is the place for you. With over 70 restaurants, lake and desert tours, golfing, tennis, parasailing, fishing tournaments, boat regattas, jet-ski races, etc. and more; you will find something that exceeds your desires. With plenty of opportunity for business, pleasure, and quality family time; The Condo Queen is here to help you.